I live in Rowe, New Mexico, about 30 miles Northeast of Santa Fe. My family has lived in this valley since 1850. Before Rowe they were in a town called Las Ruedas, which means wheels. It is right next to the Pecos River, which people depended on for agriculture, livestock, and fishing. My family helped establish the town of Rowe, which is a mile from the river, in the late 1800s when the railroad came. All of my forefathers were railroad tie makers. I actually have a problem with what they did. They changed the entire ecosystem of this area without knowing what they were doing. When I was a young kid my grandfather used to tell me in Spanish that there were a lot of trees and grass back in the day. I used to look up on the mesa and see lots of trees, so I wasn’t sure what he meant. I understood years later that he was referring to the ponderosa pine trees, which are taproot trees that were wiped out for railroad ties. Piñon juniper have taken over, which are surface root trees. He was expressing regret. The environment had changed. He told me there were springs that would pop up along the mesa. Those springs have since dried up because of the removal of the ponderosa pines. Back then we had no electricity. You went to bed when it got dark and woke up when it got light. That’s all you needed to know. Our homes are still heated by wood, and we still cook with wood. Our entire culture out here is based on wood and each person has a strong connection to the forest. It is everything to us. That is why every neighbor and local person cares so deeply about the health of the forests and trees. I was taught from a very young age how to care for the forest, and that you don’t just take everything that is available to you or easy to access. I was taught how to pick and choose the right trees, and how to find sick or dead trees. To this day, when I go and cut wood, I pick and choose trees with the health of the environment in mind, so that in the years to come we can go back to the forest. If we take care of the forest, the forest provides for us. The land has always been our life. Our dedication is to the land. We’ve always depended on the land to survive. My family were farmers and ranchers. I spent most of my summers with my grandfather, and I continue his traditions. We own pieces of land, but I don’t feel like they’re ours, only ours to take care of while were here. My wife, Alejandra, and I have four kids: Michael, 17; Anna, 20; Thomas, 21; and Danny, 25. My youngest son still lives at home. He loves to hike and explore the woods. He spends his free time outdoors instead of indoors on the computer or playing video games. It’s in his blood, roots, and culture to spend his free time outdoors. On weekends, he wakes up at 6 am and goes a few miles down the road to the river and comes back with lots of trout. I don’t eat fish but everyone else enjoys it. He’s gotten to the point where he’s making his own flies. It’s something he loves with a passion. Sometimes it’s hard because he wants me to take him to other parts of the state to go fishing, but I don’t have a lot of freedoms. The horses eat twice a day, the sheep and goats need to be milked, I can’t just shut it off. I do it on purpose though to keep me active and healthy and to keep me sane. On an average day I wake up, check on the animals, feed them, make sure they have clean water, clean the pens, let the chickens out to graze during the day, lock them up at night, collect the eggs, keep the dogs fed, and milk the goats for the traditional cheese that we make. We have a complete farm for sustainable living. If the world or the country goes to pot I have ways to survive and support my community and my family. If the grocery or trucking industry stopped we know how to hunt and dig in the dirt to grow beans, squash and corn. We have sheep, goats, chickens, cows, rabbits, and ranch dogs. People ask whether or not I butcher a calf each year, but I don’t. 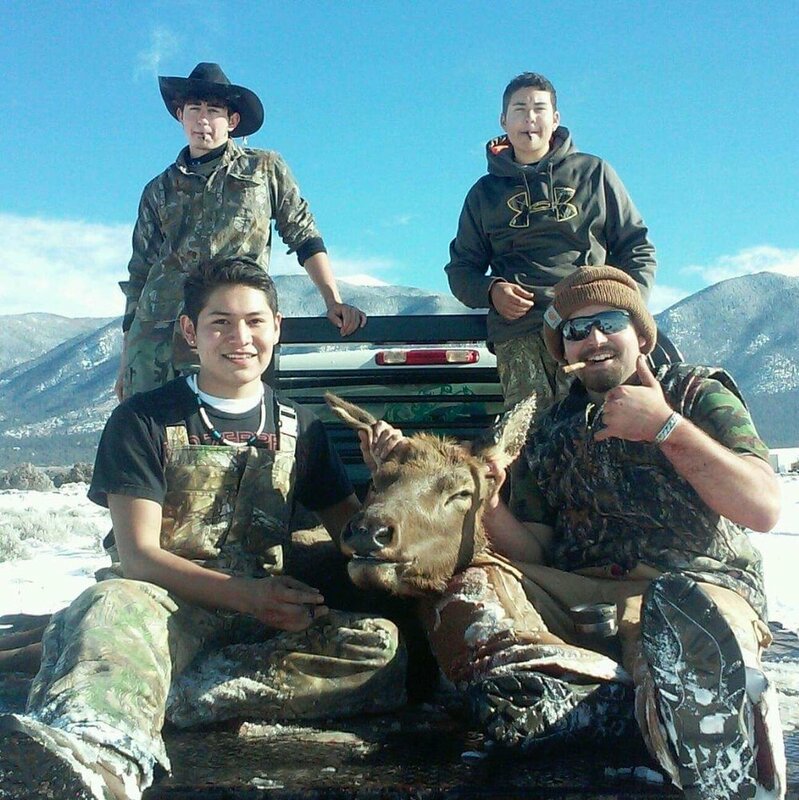 My sons are really successful hunters because they are connected to the land and the wildlife. Even though we have all this livestock, we also have a freezer full of deer and elk—which sustains us and which we share with the community. Our families were and still are very self-sufficient. They may not have had a lot of income or cash flow but they lived very well. They had milk, butter, cheese, eggs, and protein. My ancestors would chop a cord of wood with an ax, put it in the car, and drive it to Santa Fe to sell it for a little income so that we could buy some coffee or something that they couldn’t make themselves. We have peach and apple and apricot trees now and when those produce we can them. We’re very, very tied to the land. I’d say 35-40% of the food that we eat is food that we grow. I don’t need to go to the grocery store if I really didn’t want to – we do it for convenience. My passion is horses. I love everything about horses. When I’m up on the mountain on my horse it’s the most wonderful thing a person can do. I’m up in Santa Fe National Forest on a weekly basis on horseback. I live in nature and am very adamant about caring for it and watching over it. I’m not much for television or computers or anything besides being on the land. I’m also part of the Sheriff’s posse – it’s a way of giving back to the community. Since I spend so much time in the woods I’m able to help a lot with search and rescue. A lot of hikers and hunters get lost here. Because I know the mountains and forests so well I have good ideas for how to traverse this type of terrain on my horses and find people. I’m disappointed in our Forest Service right now. When I was a kid there were Forest Service personnel on horseback caring for our forest. Now, it seems that Forest Service personnel are in their offices working on computers and leaving the forests to take care of itself. Meanwhile, people who are not from around here, who don’t have the knowledge we have, are causing a lot of destruction—dumping their trash, stealing rocks, tearing up the land with four-wheelers, and leaving litter from shooting. People are even cutting down the big beautiful pine trees that I’ve driven by for years, and it really hurts me. They don’t understand that ponderosa pines take at least 2 years to dry and be used for firewood. That is why you should cut the ones on the ground, or even small ones that will dry out fast enough. It’s sad to me. These are our public lands. In addition to this destruction, we’re also losing access to our shared resources. As a little kid, I remember driving in my grandfather’s old truck with a big water tank in the back and pumping water out of the river to bring home so that he could make adobe for housing, and use the rest of the water for the garden and fruit trees. It was the coolest thing to me as a kid. All of that has been cut off to us now. I served in the military and when I got back the entrance to the river was blocked off by new private owners. We can no longer access the river where I used to go as a kid. It was a place I used to bathe as a teenager when I lived in a cabin that didn’t have any running water. All of my forefathers served our country. My great grandfathers, grandfathers, brothers and now my son have all been in the service. It’s something very near and dear to us. In the military I got to see different parts of the country and the world, including Japan, Korea, the Philippines. What helped me get through it all was imagining being back on the mesa. I ended up buying my dad’s piece of property in Rowe. This is where my heart wants to be. This is my place in the world. This is the most beautiful place on earth.